Polygon says the new Assassin's Creed, set to be revealed to the world next week, is actually called Syndicate, and not Victory, as it was called when Kotaku leaked early details of the game in December. The report is based on marketing material for Syndicate, and matches a report on Kotaku from yesterday that made the same claim. Other than the name change, it sounds like Syndicate will be much as expected. 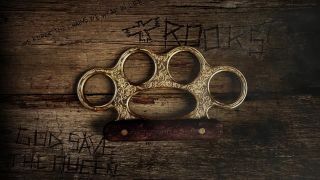 The Assassin's Creed US site now sports an image of a very nice set of brass knuckles emblazoned with the credo "Strength Through Loyalty," lying on a table carved with the messages "We forge the chains we wear in life" and "God save the Queen," as well as the word "Rooks" beside a crude image of a bird. The UK site still bears the image of a man's crossed wrists, with a cane in one hand and a wee tiny cannon strapped to the other. The game will feature an assassin named Jacob Frye, according to the report, and will "transport millions of gamers to an astonishing recreation of London during the Industrial Revolution where they will find themselves immersed in a game world they'll have to see to believe." Anyone who places a preorder with Gamestop will receive a replica one-shilling necklace similar to the one worn by Frye in the game. Ubisoft will officially unveil Assassin's Creed: Syndicate via livestream at 9 am PT/12 pm ET on May 12.